CUCCULELLI SHAHEEN works with clients to develop custom pieces for weddings, red carpet, and other special events. Within our current collection and archive, any embroidery may be moved from one silhouette to another, and we can do custom colors. Silhouette adjustments can include: adding or removing sleeves, trains, capelets, adjusting neck openings, etc. For orders involving new motifs or silhouette updates, we recommend making an appointment to view the collection. Please contact us at CONTACT@CU-SH.COM for appointment availability or for questions regarding custom orders. Each gown is made-to-order. We rework each embroidery layout to ensure the silhouette and placement are complementary and suited to the client’s shape. We also work with clients remotely, using our specialized measurement and grading process. Orders deliver in approximately 8-10 weeks from order confirmation or swatch approval, depending on the silhouette and style selected. Please enquire about our Rush Service for orders under 8 weeks [+20% surcharge]. Pricing is based on the embroidery selected, as well as any silhouette updates. Please contact us at CONTACT@CU-SH.COM for more information. We require a 100% deposit upon receipt of the order. Custom orders are non-returnable. Please contact us at CONTACT@CU-SH.COM for appointment availability. Our CONSTELLATION Series is fully customizable in Platinum, Gold, Silver, or other metallic thread work, on any color base. 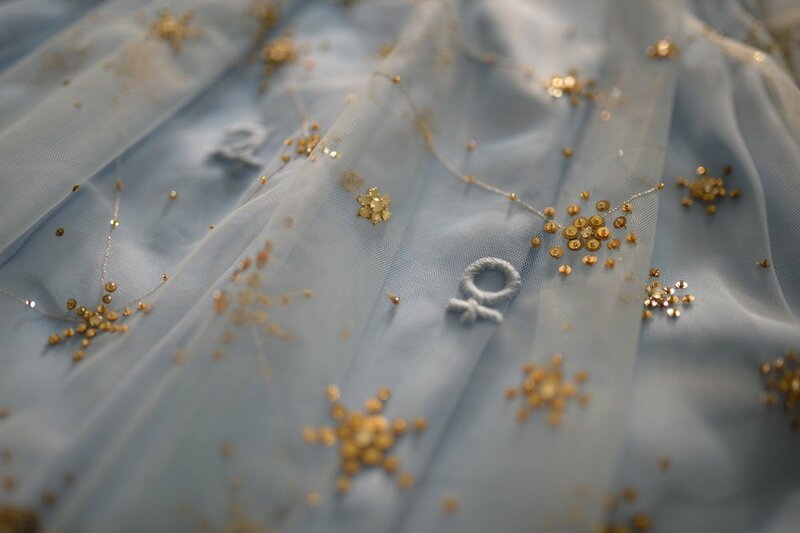 We take the location and timing of any event (Wedding, Birthday, Anniversary, Special Night, etc), and fully customize the star map embroidery for the skirt and/or cape. Additional emblems, initials, and personal details may be added as well. We typically do placements for 10pm on the date, so you can look up into the night sky and see your stars above!